Oakland’s own G-Eazy drops a classic remake of fellow Oakland Rapper Richie Rich’s infamous West Coast anthem “Let’s Ride”, and flips it and stars New West Coast veterans Blueface, YG, and Oaklands own ALLBLACK. 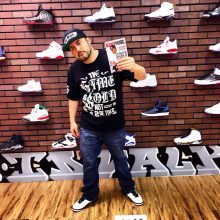 But don’t worry, he did it in style and has a very classic cameo from Richie Rich, the originator of the “Lets Ride” track, and also includes other Bay Area veterans like E-40, P-Lo, Droopiter, among other rappers and industry heads. The video was a memorable display of west coast unity, having the Bay 2 LA in full unison. The performance by LA’s hottest face to hip hop Blueface brings a different flavor and sound to LA rap, and he continues to drip his crippin onto wax, and Bomptons own YG adds to the LA cosign. Oaklands own ALLBLACK spits flame on the track and gives a great shout out to Vallejos own Mac Dre. All in all, the hype behind this track wasn’t for lack of quality or good music, in fact living up to the hype, we hope this track is a chart worthy one.